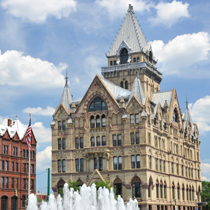 Counsel Press acquired its Syracuse office with the acquisition of the operations of The Reporter Company in 2006. The Reporter Company was founded in Walton, New York in 1881 and began offering appellate printing services in 1901. From this location we specialize in filing and service within the New York State Court of Appeals, the New York State Supreme Court, Appellate Division, Third and Fourth Departments and within the United States Court of Appeals for the Second Circuit.